Retracement alert! 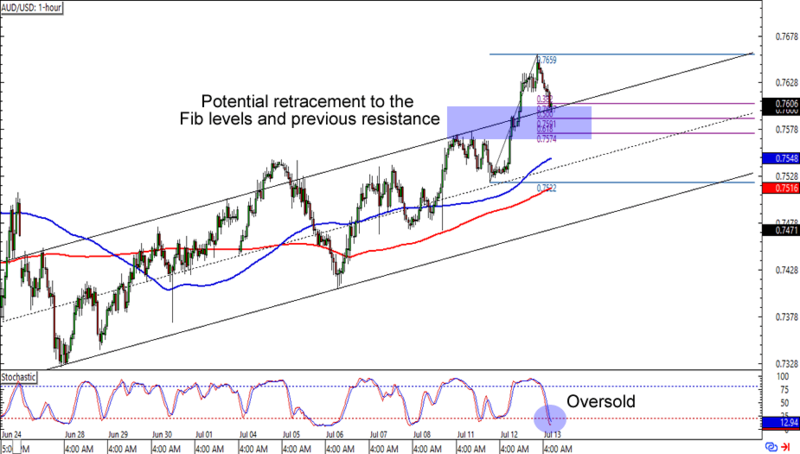 AUD/USD has been knocked down by a couple of pips after breaking above a rising channel and hitting the .7650 mark yesterday. What makes this setup interesting is that the pair is currently lollygagging at the 38.2% Fib near the channel resistance. What’s more, stochastic has just reached the oversold territory. Are we looking at a retracement opportunity here? A long trade around the Fib retracement areas could make for a good trade if you think that the Aussie isn’t done gaining on the dollar just yet. Just make sure you practice good risk management! Dollar bears huddle up! 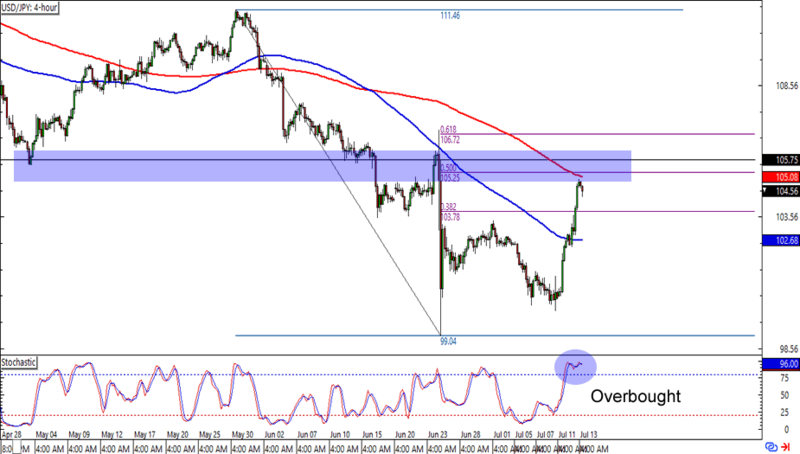 USD/JPY has halted its strong rally around the 104.50 area, which is just below the 50% Fib and 200 SMA on the 4-hour time frame. It also doesn’t hurt that the area has been a support and resistance zone since late April. The cherry on top of this sweet setup sundae is an overbought stochastic signal. Think the Greenback is about to lose pips on the yen? A short trade at current levels could give you a good reward-to-risk ratio especially if you aim for the previous lows. Make room for wide stops though, as yen pairs like this are usually more volatile than the majors. Here’s another one for the trend warriors out there! 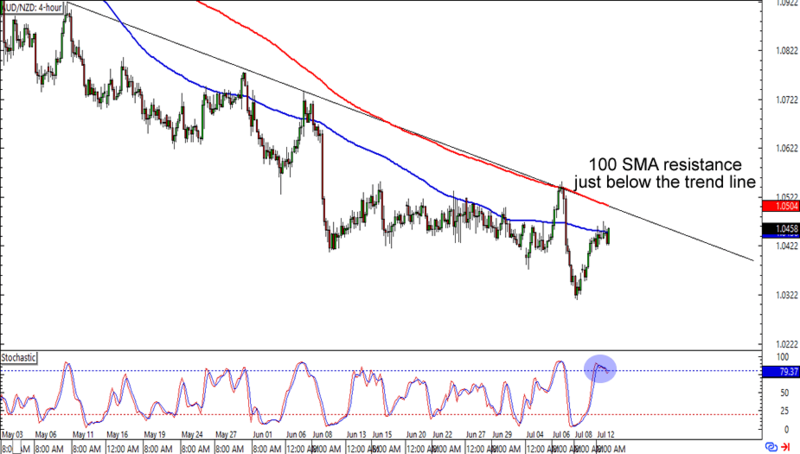 AUD/NZD is having trouble breaking above the 1.0450 area, which lines up with a 100 SMA resistance on the 4-hour chart. Not only that, but the level is also just below a falling trend line and the 200 SMA. Oh and look at stochastic chillin’ like a villain on the overbought area! You could short at the current levels if you think that the Aussie has lost its momentum against the Kiwi but you can also wait for a possible move to the trend line area if you think that the Aussie bulls haven’t lost all of their mojo just yet.